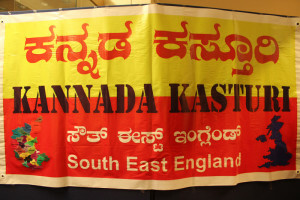 ‘Kannada Kasturi’ is the association of south east England kannadigas. What started as an informal discussions among friends has grown into a substantial membership of 160+. On April 23rd 2016, Kannada Kasturi celebrated its first ever annual event of ‘Ugadi celebrations’ at Townley Grammar School Bexley Heath, Kent. At 3:30 PM there was registration and a warm welcome. Aura of festive celebrations was in the air with everyone arriving in bright and colourful Indian Ethnic wear. After the initial registration, refreshments were served and people got introduced to each other. The most awaited cultural events started at 5PM with the traditional lighting of the lamp and invocation to lord Ganesha followed by Bharatanatyam. The ‘Karnataka Vaibhava’ was a witty play aimed at introducing the younger UK born generation to the rich cultural heritage of Karnataka. The play was themed around time travel where two young girls from London and Bangalore respectively, travel through history of the state, meet famous personalities of the state and get to relive the glory of the bygone era. The audience were introduced to Shantala, Amarashilpi Jakanachari,king Krishnadeva Raya, his famous jester Tenali Rama, Brave warriors Madakari Nayaka, Onake Obavva and Kittor Chenamma. Greats of the 20th century including Rashtrakavi KUVEMPU, Movie legend Dr Rajkumar, Cricket players Rahul Dravid and Anil Kumble and beauty queen Aishwarya Rai were all introduced in the play. The audience were treated to a literary musical fest with soulful rendering of famous kannada songs including ‘Jogada Siri written by Nisar Ahmed ,’Deepavu ninnade’,’Tumbu tingalina’ written by KS Narasimha Swamy and others. There were also solo performances for old and new movie songs. Talented Yoga team of Kent Kiladis gave a terrific yoga performance choreographed to music. Children performed a fusion musical of ‘Krishna ne begane baaro’ followed by Shloka recital. Children from various age groups danced to popular music including ‘Ghallu ghallenuta’, ‘Bannada tagadina Tuttoori’. It was not just children having fun through these performances. Talented ladies dance group danced for ‘Kodangana Koli nungitta’and Kolaata (traditional dance using sticks) for ‘Cheluvaiyya Cheluvo’. Men also gave a display of their dancing talent to a medley of popular Kannada movie songs. The final showpiece was the innovative ‘Chitramanjari’ programme which saw couples shaking legs to the golden oldies as well as new movie songs. The cultural programmes were completed at 7:30 pm followed by scrumptious dinner. After the dinner there was another surprise in store. Everyone danced to a peppy Kannada Disco with colourful lights adding to the ambience. The programme ended with the resolve that there will be more such events in future. Many new friendships were formed and children were enriched with the knowledge of their rich heritage, traditions and values.